Today it's the International Women's Day and later this afternoon I will sing and speak at the Vänern Museum in Lidköping here in Sweden. There are many women I admire and this day I want to highlight a young and very admirable woman. I have just finished listening to the book "Malala" written by an amazing woman who, despite threats and great resistance, stood up for all childrens, particularly girls, right to study and go to school. 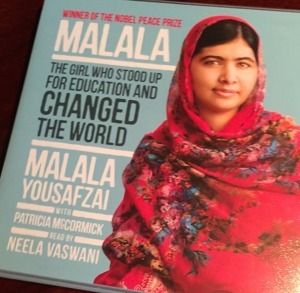 "One child, one teacher, one book, one pen can change the world" says Malala Yousafzai. A very strong life story that inspired me tremendously. Read it if you have the opportunity, it is good to read about courage, tenacity and determination. We all have tremendous potential to influence our world to become a better place to live. A few days ago I was in Ljungby and lectured high school students. They were great and lovely! Listened attentively and had good questions. So I said that Ljungby must ne a nice city to live in but was met by a noooo from the students. Very strange, I thought, so I finished clarifying precisely what I think is so important. You and I are the ones who shape the environment we live in. Everyone have the right to take part, have the same rights and obligations. We all have the same value, all are entitled to be respected regardless of whether we are male or female, old or young, physically or mentally challanged or not (who aren't?). Kindness, encouragement, and love is what we all need most. If we get it, we become confident, well-being and flourishing as people!